The author ignores the fact that prices collapsed before Waxman Markey was even in the news. Take a look at the author's 2nd chart - when the bill actually passed in June of this year, CCX prices were already trading at all time lows. No, Waxman Markey did not kill the CCX contract; prices collapsed with natural gas (as well oil, stocks, and other markets) in late 2008 and early 2009. Now, as markets, particularly stocks, have rebounded, the CCX remains depressed. 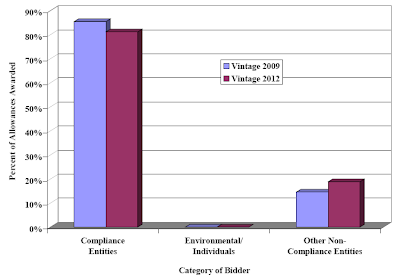 Waxman Markey probably isn't helping, but other U.S. carbon markets like the Regional Greenhouse Gas Initiative have seen the value of their voluntary offset contracts hold up. The story behind the path of CCX contracts is not nearly as simple as the argument given in this piece. 1. He is indeed correct on the Waxman Markey timing issue. However long before the bill was proposed, the market participants were well aware that as the financial crisis hit hard, Congress will have no appetite for any bill that would cause the US industry to cough up funds for carbon allowances. At least not in the near future. The market thus responded, dumping the CCX contract. As the details of the bill became clear, and more importantly the opposition to cap-and-trade as a concept straightened, any chance of CCX contact recovery became less likely. Thus federal level legislation (or lack thereof) is indeed the key cause of the CCX contract pricing problem. "RGGI is the first mandatory, market-based CO2 emissions reduction program in the United States. The states of Connecticut, Delaware, Maine, Maryland, Massachusetts, New Hampshire, New Jersey, New York, Rhode Island, and Vermont are signatory states to the RGGI agreement. These ten states have capped CO2 emissions from the power sector, and will require a 10 percent reduction in these emissions by 2018." If participants are forced into this program by their respective state governments, it will certainly improve the allowance pricing relative to the CCX contract. That's exactly the point here. Even with the state requirement, the clearing prices were quite low: $3.23 for the 2009 emissions and $2.06 for 2012, vs. EUR 14.50 in Europe (where cap-and-trade is federally mandated). Without a strong and immediate federal cap-and-trade bill, this market is facing an uphill battle.